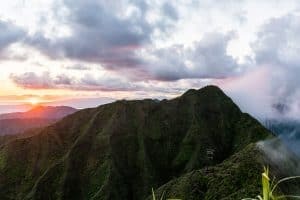 Most people visit Oahu for the constantly sunny weather and pristine beaches, but there’s a lot more to this island than you may expect. Volcanic activity has shaped the landscape of Oahu with mountains and plateaus that are not just beautiful to look at. They make for amazing hikes. Have you ever seen the original Jurassic Park movie? Of course you have. Well, imagine walking through the Jurassic jungle from the movie – without the fear of getting eaten by a T-Rex. That’s kind of like what it’s like to hike in Oahu. In fact, parts of the movie were filmed on a ranch in Oahu. You can’t hike there (although you can horseback ride or take an ATV adventure), but there are similar scenes in the surrounding areas. Not every hike will be the same. Some lead to beautiful beaches while inactive volcanoes and breathtaking waterfalls are the centerpiece of other hikes. 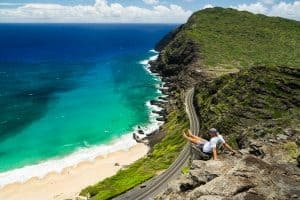 But regardless of where you go, you can bet you’ll be amazed by any one of these Oahu Hiking spots. Duration: About 90 minutes to hike all 3 pillboxes. 30 minutes to the first. Lanikai has been dubbed one of the most beautiful beaches in the world, on at least one occasion. So whether you choose this hike or not, you should plan a visit to the beach. It has gotten more popular among tourists over the years, but it’s still a quieter option than Waikiki Beach. 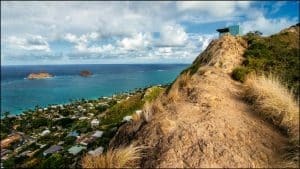 This hike gives you an amazing view of the residential area and the crystal-blue waters of Lanikai Beach below. In addition, you’ll get to see Mokula Islands, Kailua Beach, The Chinaman’s Hat and Kaneohe Bay. This one is also a short hike that you can do in the morning before spending the rest of the day lounging on the sand. It can be hard to find easy Oahu hiking trails, so don’t underestimate this one. It starts off rather easy, but there’s an intense incline ahead. It’s so intense that you’ll find a rope along the trail to help pull yourself up. This part is kind of like a mix between hiking and climbing. If it has recently rained, be careful. When this trail gets slippery, it’s easy to lose your footing. You’ll get a reprieve on the inline after the first five or 10 minutes, but it’s only temporary. Remember, to get the best views, you must reach a high elevation. The best way to describe this Oahu hike is that it’s short and sweet. There are intense moments, but it’s not a terribly difficult hike. As long as you can stand short stints of climbing, this is a hike you shouldn’t refuse. TIPS – Be careful about where you park. Residents in this area get upset when hikers park on their streets, which is understandable. There are legitimate spaces set aside for public parking. Use them. Also, you might be tempted to climb on the roof of a pillbox to get the perfect shot. A pillbox is a name used for a concrete fort that’s partially underground. These structures haven’t been used in many years, and safety isn’t guaranteed. People do it often, but it can be dangerous. Think before you make this call and evaluate the risks. It’s rare that you find easy hiking in Oahu with rewarding views. The Lanikai hikes are an exception. Koko Head is not. 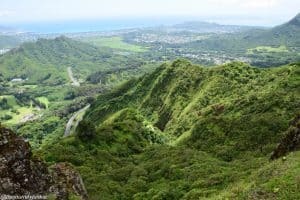 This is one of the best hikes in Oahu, but you’re going to work for those rewarding views at the top. To get to the top of the mountain, you’ll need to climb some steps: 1,050 to be exact. But don’t worry, after the first 1,000, it’s a piece of cake. Your legs will probably be so numb you won’t know you’re climbing. The steps at Koko Head were once part of a railroad track that ran supplies and military personnel to the Air Force Station at Puu Mai in WWII. You’ll want to start his hike before the sun comes up to avoid overexerting yourself in the heat of day. Try to get to the trail by about 5:30 am. It’ll still be dark but cool, so it’s a good time to start your ascent. As a bonus, you’ll get to watch the sunrise at the summit, which is an incomparable experience. At the top, you’ll enjoy incredible views of Hanauma Bay, Koko Marina and Sandy beach. Then, it’s time to head back down. If you’re thinking the way down will be easier, you might be in for a surprise. Remember that these aren’t typical steps and your legs will undoubtedly be very tired, even after a break at the top. TIPS – If you do set out before the sun comes up, bring a flashlight or wear a headlamp. And don’t skip breakfast! Important: This hike is on the list because many people will be looking for it, but it’s highly dangerous and illegal. Attempt this hike, and you could be faced with $1,000 fine and jail time. There is another option that’ll explore at the end. 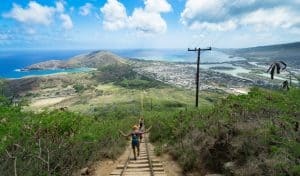 If you’ve been interested in hiking in Oahu for some time, you’ve probably heard of the Stairway to Heaven hike. You’ve probably saved an Instagram post with an incredibly beautiful image and placed it at the top of your bucket list. No one would blame you. It’s gorgeous. But you may not have known about the dangers (how would you?). 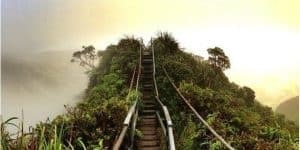 The Stairway to Heaven hike was originally called Haiku Stairs. It includes 4,000 steps that are guarded 24-7. The original name Haiku Stairs is nicknamed the Stairway to Heaven due to the 4000 steps taking you to the clouds above Oahu. Not only is there numerous “No Trespassing” signs there are guards 24 hours a day. If the $1,000 fine won’t deter you, the storm damaged stairs down vertical ridges might. There is a legal way to hike around the Stairway to Heaven, but you won’t ever get to the Haiku Stairs. The legal trail starts at Moanalua Valley Road and veers left for about 2.5 miles. This is a much easier hike than the Stairway to Heaven, but you can still expect some steep inclines with vertical ropes and muddy areas. To get to this trail, you’ll have to head to the South East part of Oahu. The trail begins at Makapuu head along the western ridge and passes the historic Makapuu Lighthouse. 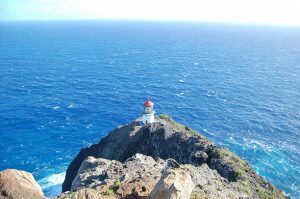 The Makapuu Lighthouse was built in the early 1900s and was featured in the film, “50 First Dates” with Adam Sandler and Drew Barrymore. It was the site of their first kiss (aww). This is a perfect hike for the whole family as it’s one of the easiest of all Oahu hikes. It spans a short two miles and is completely paved. Unlike may other Oahu hiking trails, there’s only a slight incline. Because it’s an easy hike, this one is popular, but it never gets that crowded feel. Instead of just one scenic spot, there are many, so there’s room for everyone. The paths are also rather wide. On a clear day, you can see Rabbit Island and Molokai and Lanai Islands. And if you take a detour (of an hour), you can also visit Makapu’u Tidepools. If you’re bringing the fam, try to do this one on a calm day. Waves can get intense when the wind picks up. TIPS – Parking is somewhat limited, so you’ll want to arrive early. Keep in mind that there’s no shade on this hike, so wear hats, protective clothing and plenty of sunscreen. There are also no restrooms along this trail, so make sure everyone goes before you get there. Diamond Head is one of the most recognizable landmarks in Oahu, especially since it’s just a walk from Waikiki Beach. But that’s also why you should expect crowds. Because everyone on Waikiki Beach can see the mountain, it tempts many tourists. If you plan to summit Diamond Head, get out as early as possible (at sunrise, if you can). 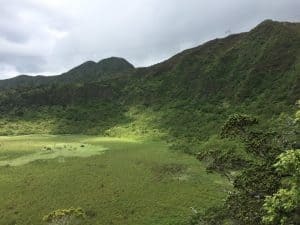 This landmark was named by British sailors in the 1800s because it has glittering stone that reflect light at the top of the crater. In total, the trek only spans 1.4 miles, but you’ll feel like you’re going further. There is a very steep gradient, so it may take you 2 hours to go 1.4 miles. The US Army built a trail in 1908 that has handrails and paved steps, which makes the trek easier but not easy. As you approach the summit, you’ll see more evidence of military activity as you climb through a bunker and up a spiral staircase through the old Fire House. 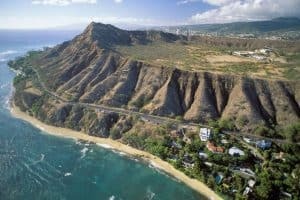 Diamond Head is one of the most popular hikes, but it’s also considered one of the best hikes in Oahu. Brave its steep steps and narrow corridors and you’ll be rewarded with some of the best views Honolulu has to offer. You can even look down on a volcanic crater that was formed over 300 thousand years ago. TIPS – If you’re claustrophobic, you may want to skip this hike. There are many narrow corridors that could provoke a panic attack. There’s a small entry fee of $1 per person and they don’t accept cards. You may find people selling certificates at the top, but this is nothing more than one of those tourist scams. It’s nothing more than a piece of paper. This is an easy and extremely popular hike that many tourists and families take. But that doesn’t mean you should skip it. Sometimes, the road more traveled is traveled for a reason. 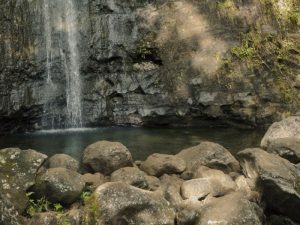 This Oahu hike is located in Manoa Valley and takes you to a 100ft waterfall. The trail itself is very easy and kid-friendly. The entire trail is outfitted with gravel and small rocks. It starts at the parking lot and spans through jungle-like terrain. You can follow this hike on your own or go for a guided tour. The guide isn’t necessary, but it’s helpful if you want to learn about the flora and fauna that blanket the area surrounding the waterfall. This is a relatively safe hike for the entire family, but it’s not without risks. You may have heard the recent news of a man who fell from the top of the falls and died. Stay along the trail and avoid risky behavior and you’ll have a great experience. TIPS – Be prepared to get your feet dirty. It rains a lot in Manoa, so this trail can get very muddy. Visit on a weekend to avoid crowds. This intense trail will take a minimum of 5 hours to complete, but you’ll probably spend another hour or more taking pics and basking in the glory of this natural beauty. This trial is filled with waterfalls, rope climbs, a giant crater and insane panoramic views. If you can handle a difficult hike, you must follow the Ka’au Crater trail. Hands down, this is one of the most rewarding hikes on Oahu. But you should expect a full 5 hours of intensity. Don’t think you’re going to ease your way into this. From the very beginning, you’ll feel like you’re on an episode of Naked and Afraid, fighting for your own survival. If you can handle this hike, it’s an amazing experience. TIPS – This hike is already difficult, so be sure to go on a dry day, and if possible, bring someone who has done it before. Even experienced hikers have trouble with some spots along this hike. Not only is this hike difficult, but it’s dangerously steep. It is a popular hike among avid hikers, but understand that you follow this trail at your own risk. Even if you’re the most experienced hiker, an extreme gust of wind can threaten to knock of you off the cliff. Pali Notches is a narrow ridge hike that includes rock climbing over man-made notches. According to legend, these notches were made in the 1700s by King Kamehameha’s warriors to hold canons and keep the Nu’uanu Valley secure. You’ve read that this hike is dangerous. Read it again: This hike is dangerous. Many people have fallen while attempting Pali Notches. One young man died on this hike, and another had to be airlifted after being critically injured at Pali Notches. The trail-head beings at the right side of the Pali Lookout platform on an unmarked trail. As soon as you step over the yellow chain fence you’ll see the faint markings of a trail. This is it. TIPS – If you’re going to hike Pali Notches, make sure you’re physically up for the challenge and choose a clear, dry day. This hike begins across from the Makapu’u lookout car park, and it’s a long hike that’s not particularly difficult. It does span 7 miles, so you must be fit enough to manage this within a day. It helps to start early, especially if you think you’ll need a few breaks. TIPS – You always have the option of turning back at any point. If you’re not up for a 7-mile hike, you may want to turn around at the puka (hole in the rock), which you’ll find at about 45 minutes in. The trail for Wiliwilunui Ridge begins in a residential neighborhood high up in the mountains. There’s parking for about 6 or 7 cars, so be sure to get there early. At the summit on a clear day, you can see the Waikiki skyline that seems like another world from your viewpoint. On the other side, you’ll get an amazing panoramic view of turquoise water. The trail spans 4.5 miles out and back. TIPS – You’ll need a pass to get into the gated community, and security will give you a parking pass. The plus side is that this hike tends to be more on the low-key side. Hiking in Oahu is unlike anything you’ve ever experienced. Choose a hike for your skill level and brace yourself for an adventure of a lifetime.